Gilad Ratman presented The Workshop (2013), a multi-channel, site-specific installation at the Israeli Pavilion at the 55th International Art Exhibition – La Biennale di Venezia. ‘The Workshop’ is based on a fictional underground journey from Israel to Venice taken by a small community of people. Their epic voyage starts in the caves of Israel, weaves through treacherous subterranean passages before bursting through the floor of the Israeli pavilion. On arrival, the group turn the pavilion into a workshop, sculpting themselves in clay they have transported from Israel. Gilad Ratman’s presentation reflects on the Biennale as a utopian model of nations’ connectivity. Whilst present-time political reality all over the world operates according to the ‘nation state’ concept and a system of globalized capitalism, The Workshop presents a scenario where transit takes place across national borders in hidden underground networks – free, undetected and unidentified. Ratman’s narrative manifests itself in a non-linear presentation of video, installation, sound and a physical intervention in the fabric of the pavilion itself. The site-specificity of The Workshop – the videos and the sound – offer the viewer a reflection of an event that has taken place at that very location. In doing so, the work creates a fictional, yet true, history. 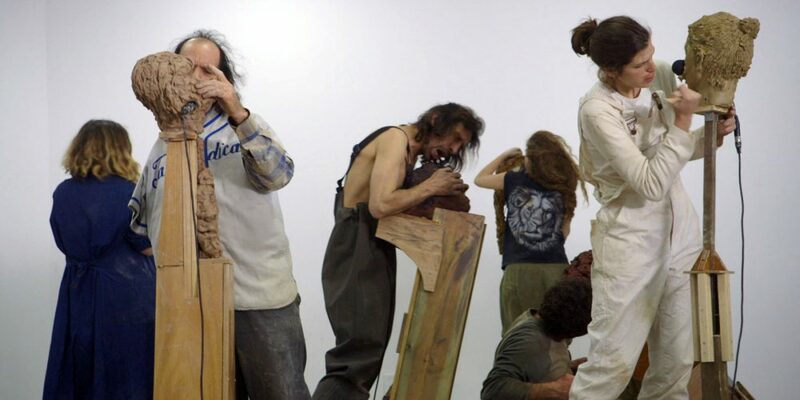 Representing themselves in clay busts, which are accompanied by guttural voice recordings, the group’s workshop event suggests a return to a pre-linguistic stage of early human society. Ratman explores the tension between universal patterns of human behavior on the one hand and the divisions of language, nationality or government on the other. Curator: Sergio Edelsztein, Director and Chief Curator, Center for Contemporary Art, Tel Aviv.